Pectoral cross is made of brass and covered with 24K silver galvanized layer. The crucifixion is made in the technique of hand-painted finift' enamel. 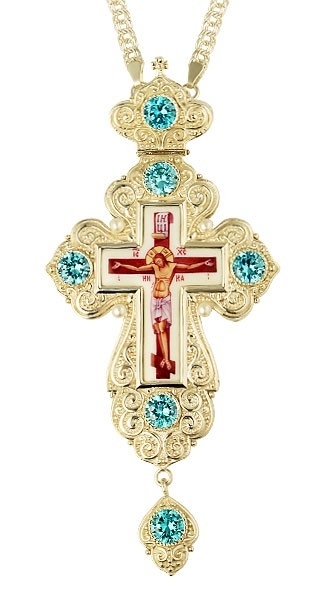 The front side of the cross is decorated with floral ornament and inserts of phianite stones of excellent quality, hand bracing. The cross is sold in a presentable man-made leather packing with velvet lodgment. There is a matching Bishop encolpion-panagia for this cross with SKU: PGA-0874L-1.